Historically, board roofs were most common in outbuildings of minor importance. Today, after the material has become popular again, all sorts of buildings, public housing included, are designed to have a board roof. Sometimes, when proper consideration is not given to layers under the roof, such a solution can become rather problematic. Wood is a living material and plays a lot; therefore, some of the edges may twist and warp as a consequence of unfavourable circumstances coinciding. 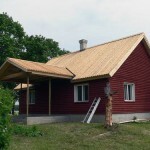 Historically, two methods were employed to lay a board roof: horizontal and vertical, the latter involving an overlap. We usually fit board roofs, made of softwood boards with a thickness of 32 mm. The lower board layer will have the width of 150 mm, which will be then covered with 100 mm boards, fitted to ensure at least 25 mm overlap. The edges of roof boards are milled to ensure the efficient discharge of water and serve to extend the service life of this type of a roof. Regular maintenance and tarring are a must to ensure the good appearance and long service life of board roofs. Maintenance involves the removal of loose debris that may have accumulated on the roof (twigs, leaves, moss, etc.) and sweeping off the fine dust that tends to absorb moisture, therefore facilitating the growth of both lichen and fungi. A fresh coat of tar or tar oil will help to maintain the natural characteristics of the wood that is supposed to last under daily attacks of intense UV radiation. 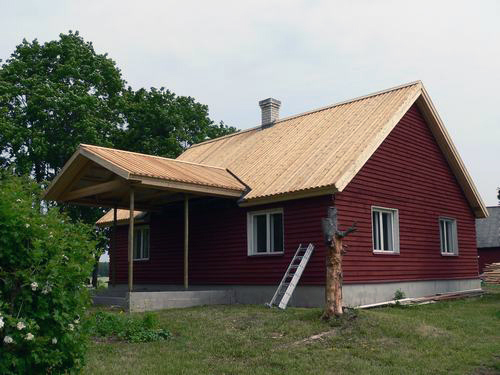 The length from eaves to ridge is highly important when designing a board roof – a good roof should be made of uninterrupted boards. Finding boards longer than 6 metres is quite complicated today, as manufacturers must obtain non-standard logs for that purpose. We have some good contacts and so far, boards with the maximum length of seven metres have never been a problem.